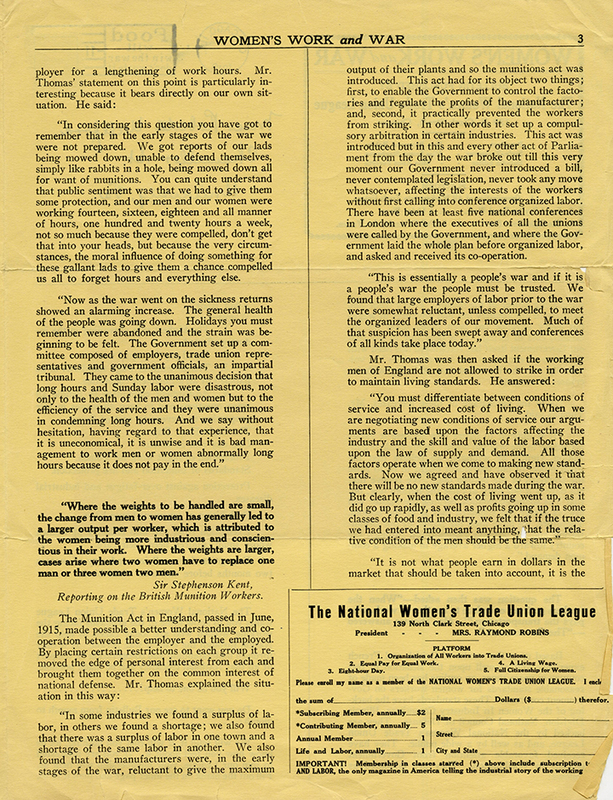 Women's Work and War: A Bulletin of Facts Concerning the Employment of Women to Meet the Deficit of Man Power in Our National Industrial Emergency. 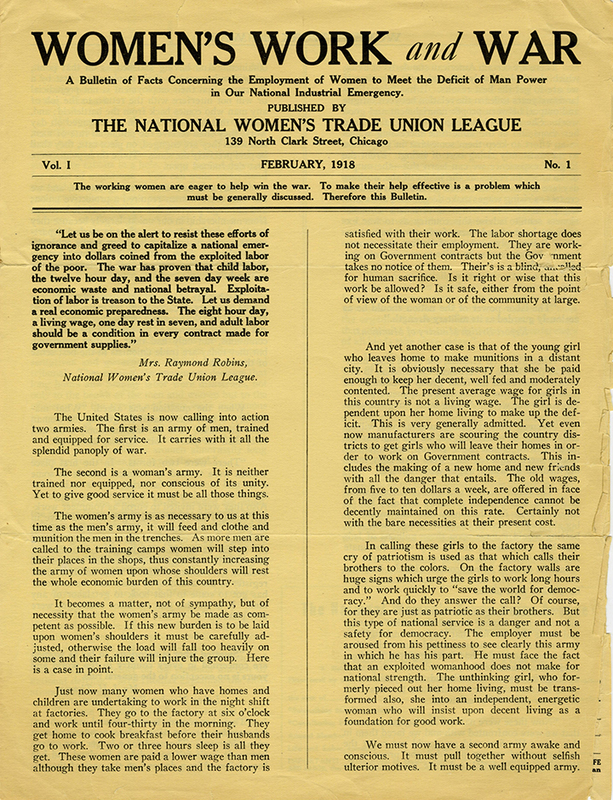 Published by the National Women's Trade Union League. 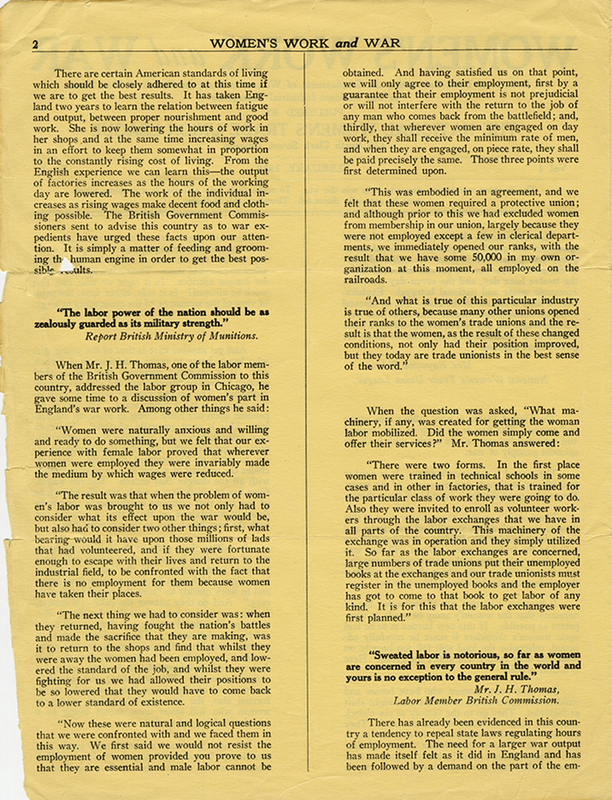 p.1 "The working women are eager to help win the war. To make their help effective is a problem which must be generally discussed. Therefore this Bulletin." "The United States is now calling into action two armies. The first is an army of men, trained and equipped for service. It carries with it all the splendid panoply of war. The second is a woman's army. It is neither trained nor equipped, nor conscious of its unity. Yet to give good service it must be all those things. The women's army is as necessary to us at this time as the men's army, it will feed and clothe and munition the men in the trenches. As more men are called to the training camps women will step into their places in the shops, thus constantly increasing the army of women upon whose shoulders will rest the whole economic burden of this country." 1. The highest rate prevailing in the industry effected. 2. Equal pay for equal work. 3. Trades without wage standards to be handled by an adjustment committee. 4. Adjustment committee to handle all wage questions and to keep all wages in fair proportion to increasing cost of living. One day rest in seven. Prohibition of night work for women. Standards of sanitation and fire protection. Protection against over-fatigue and industrial diseases. Prohibition of tenement house labor. Exemption from call into industry of women whose small children need their care. Exemption from call into industry of women two months before and after child birth." Note postmark promoting food conservation during World War I. "Food will win the war. Don't waste it." 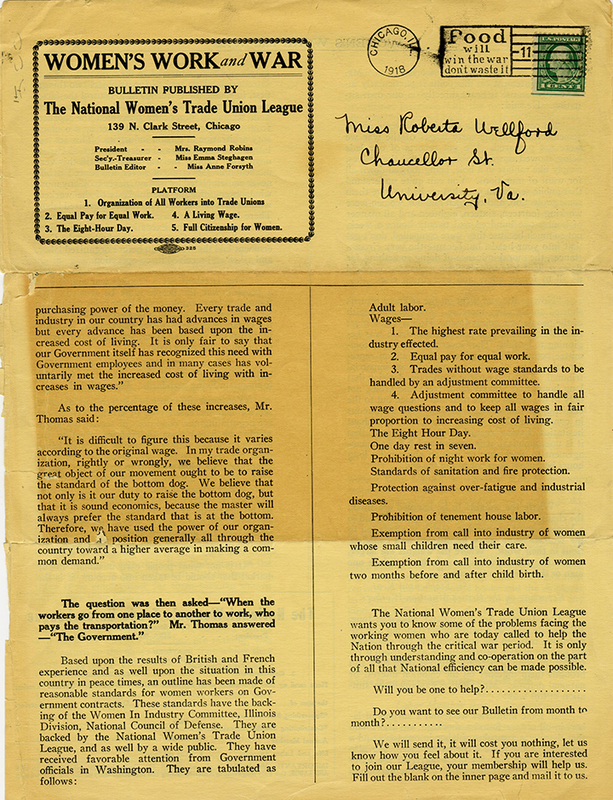 National Women's Trade Union League, “Women's Work and War,” Social Welfare History Image Portal, accessed April 26, 2019, https://images.socialwelfare.library.vcu.edu/items/show/108.